The Oconto County Historical Society (OCHS), which was founded in 1940, is based in Oconto, the county seat of Oconto County, Wisconsin, USA. 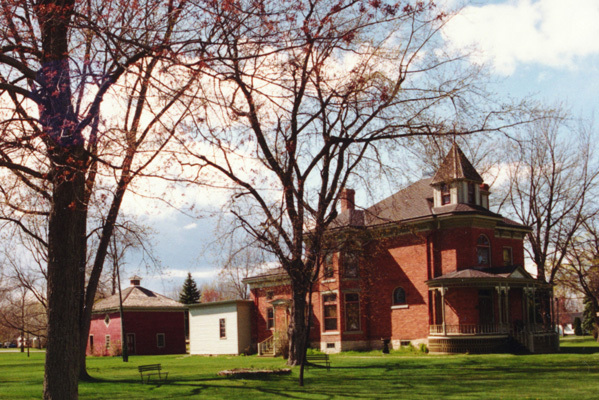 It maintains three buildings: the historic Beyer Home Museum, a restored and completely refurnished 1890s home of a prominent family; the George E. Hall Annex which contains permanent exhibits on Old Main Street-Oconto, “County Waterways”, and temporary exhibits, research files, photos, and artifacts in storage as well as having the new 5200 sq ft Carriage House addition; and an urban barn. A gazebo was moved onto the property in 1998 and an 1870s log house has been moved to the site and restored. The OCHS also helps administer the Copper Culture State Park, and the Holt & Balcom Logging Camp, gives tours of the First Church of Christ, Scientist. OCHS is an affiliate of the State Historical Society of Wisconsin. Definition: As is often the case, conflicting explanations have been given. 1) Oconto takes its name from its chief river. The significance of this word is variously given as “red ground” or “the place of the pickerel” or the Menominee word for “black bass.” The latter would seem to be correct, since upon many of the early maps (1820-50) the stream is noted as Black Bass River. 2) From Chippewa word uh-cun-do-win, meaning “a watching outpost” (against hostile forces). “It seems that when Green Bay was a trading center all tribes resorted to the locality including tribes hostile to each other. At the Oconto river the Chippewa kept a small settlement to keep their people informed of the movements of enemy Indians.” Oconto, in Chippewa, is “Okando” (he watches, lies in ambush, lurks).